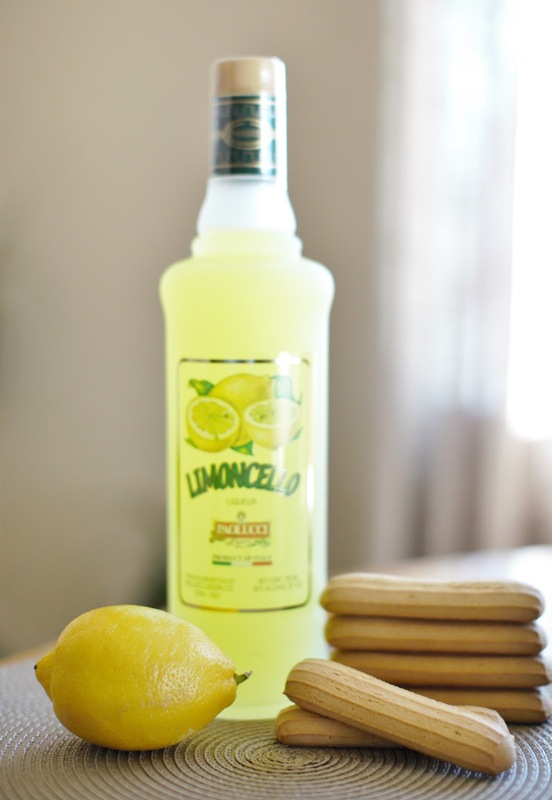 We first experienced Limoncello on our trip to Italy several years ago. A unique lemon liquer produced mainly in southern Italy. 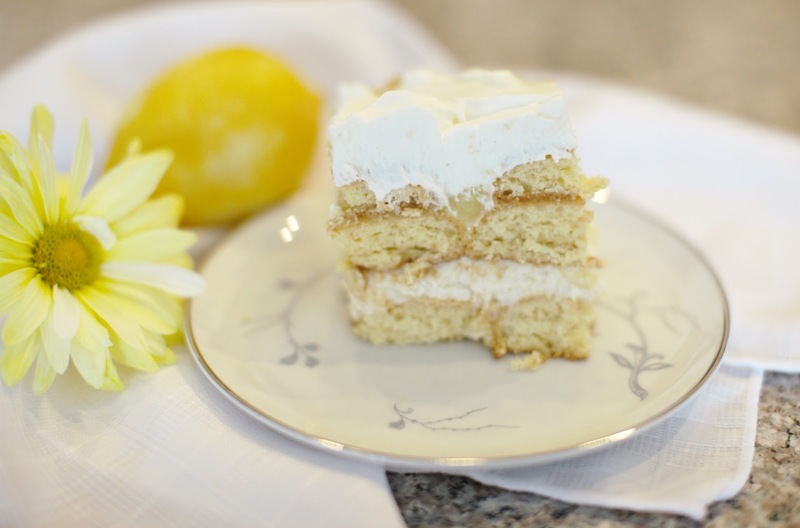 When I began the hunt for a dessert recipe for this weekend's dinner party, I somehow stumbled across this twist on the classic Tiramisu (which I love, by the way) using Limoncello instead of Kahlua. Well, twist my arm.....I'll give it a go! This was so yummy! Tangy and lemony. Just a wonderful dessert, that your guests will absolutely love! Tip: Make the lemon curd first, allowing it to cool while you start assembling the rest of the dessert. *the classic tiramisu uses mascarpone cheese which can be pretty pricey, while this recipe used ricotta instead. Ricotta is definitely cheaper, but still had a creamy flavor. This step has you diluting the limoncello, which absolutely makes sense since it is a very strong liquer. The original recipe called for 2 cups limoncello and 2 cups water. I had way too much liquid leftover...so I'm recommending cutting that down by a ½ cup. Hate to waste Limoncello! 1. In a large mixing bowl, combine ricotta, confectioner's sugar, zest and 1 Tbsp. Limoncello. Mix to combine. Set aside. 2. In a medium sized pot, bring water and Limoncello to a simmer. Keep at a simmer for five minutes. Remove from heat and pour into a shallow heat safe dish and allow to cool for five minutes. 3. Dip the lady fingers halfway into the warm Limoncello mixture and line the bottom of a 9x13 pan with the soaked lady fingers. Once the bottom is covered with lady fingers, spread the ricotta mixture over the top. 9. Refrigerate for at least four hours. Preferably overnight. Serve chilled. In a 6 quart saucepan, combine all the ingredients. Cook over medium low heat until first bubbles appear on the surface. About 6 minutes. The mixture will continue to thicken as it cools. I decided that I really need to work on getting better at eating veggies. I know there are wonderful nutrients to be had in vegetables, and generally they are very low in calories; they're just not at the top of my favorite food list. So, this year I'm attempting to find some good recipes that will allow me to enjoy them more often. This particular recipe is really tasty and even better it's a crockpot recipe. So, you know what that means....easy, easy, easy!! It was ready in just under 15 minutes. 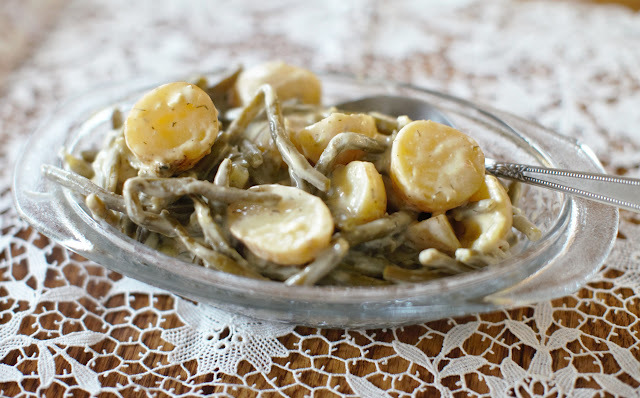 Place potatoes and green beans in a slow cooker. Combine soup, water, mustard and dill weed. Pour over the veggies; gently stir to combine. Cover and cook on low setting for 6-7 hours. Gentle stir before serving. Enjoy!! I'm having so much fun being totally involved in the basement finish for my new studio! I was able to make the best transforming a piece of the basement in our old house into a studio/workshop for myself, but I worked with what we had done to finish the place when our daughter was a toddler. This time, I'm deciding everything....from where I want a closet, to electrical placement, to each of the components of the finished bath, the walls, floor, etc. It's a kick-in-the-pants!, and so far, it's coming together just as I imagined. One of the projects that I wanted to have a hand in (literally) was the bathroom. First off, I'm thrilled that we decided to invest in a bathroom, so both my clients and I can take advantage of it as needed. We didn't take the time to do this in our old basement, so this is going to be a real treat! I've always loved the look of vessel sinks and I knew that's what I wanted down there. I also wanted the sink to sit on top of a special piece of furniture. 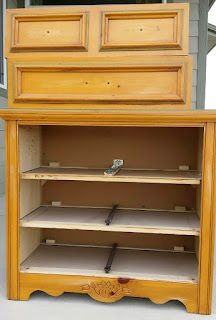 I looked at buying something at one of the local box furniture shops, but decided to buy an old dresser at the ARC store ($15) and refinish it myself. The entire area is going to have an "industrial" feel, and the bathroom is no exception. Since I've played around with several furniture distressing projects in the past, I thought this look would fit right in with my vision. The top two dresser drawers were converted to "false" drawers to allow the plumber to do his thing with the water lines to the faucet. 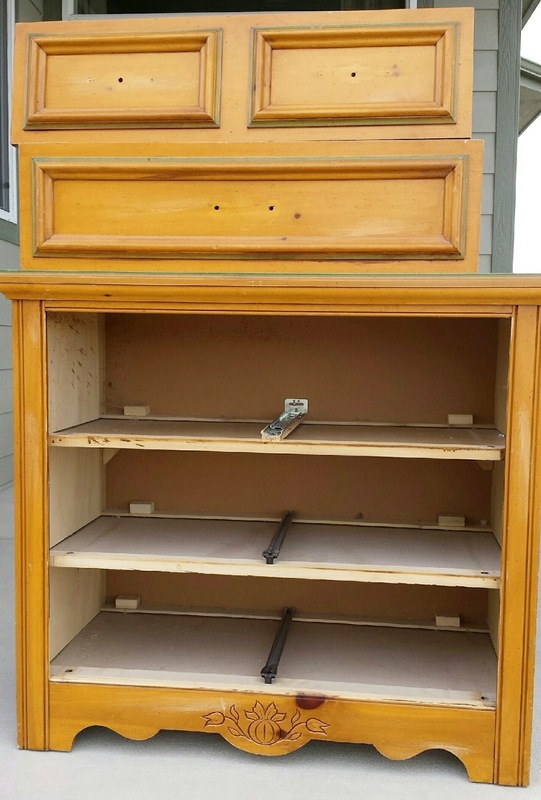 The bottom drawer is functional; allowing for towel, and toilet paper storage. 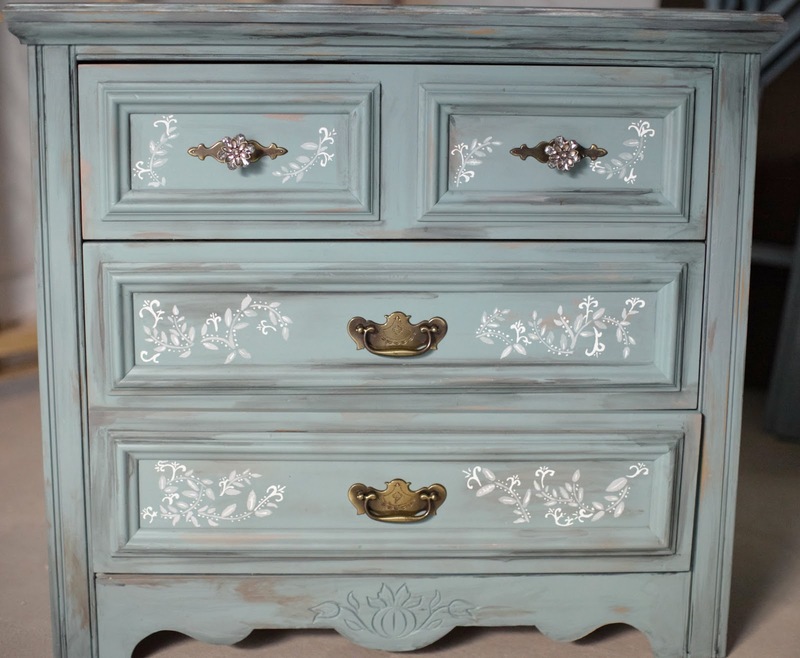 I found a really beautiful turquoise spray paint color and took to painting the dresser after a light sanding. After I laid the initial color down, I painted on some black, tan, and grey to "age" the piece. I chose to add some stenciling to the drawers using white and grey paint. 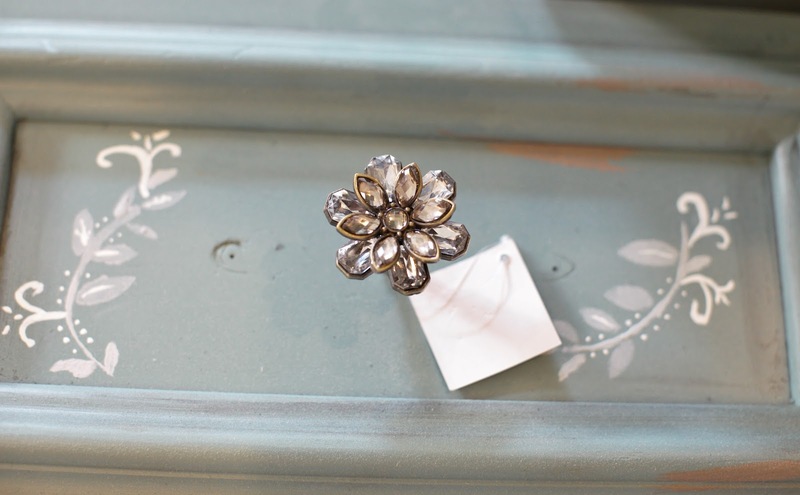 Finally, I picked up two new crystal flower knobs at Hobby Lobby for the top drawer, since I didn't like the size (too small) or look of what was originally on there. They're just the right touch and compliment the existing pulls just great. I am absolutely thrilled with the final outcome! The white vessel sink I purchased is just perfect for this piece. We're probably 2 ½ weeks out before the bathroom will be finished and we can put this little beauty in place....but I just had to share! 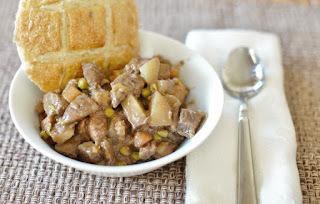 Every so often I get a taste for a good beef stew. When it's cold outside, there's nothing better than a bowl full, especially after you've smelled it simmering all day long! This particular recipe is fairly easy....a bit of prep, but then throw it all in the crock pot and let it cook all day long. 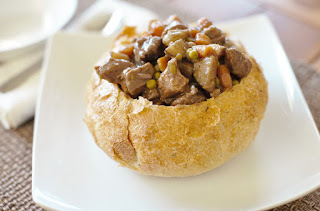 This particular recipe is chock full of meat, potatoes, carrots, onions and peas. Place meat in a large storage bag. Add flour salt, and pepper and shake to thoroughly coat the meat. Place in the cooker. 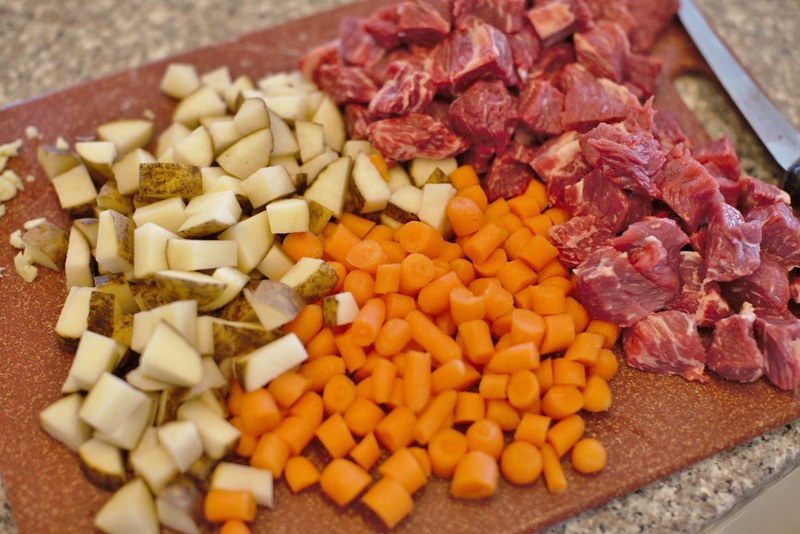 Add the garlic, bay leaf, paprika, worchestershire sauce, onion, beef broth, potatoes, carrots and peas. Cover and cook on low setting for 10-12 hours; or on high for 4-6 hours. The flour mixture nicely thickens the sauce as it cooks, and the meat and veggies turn out so tender. 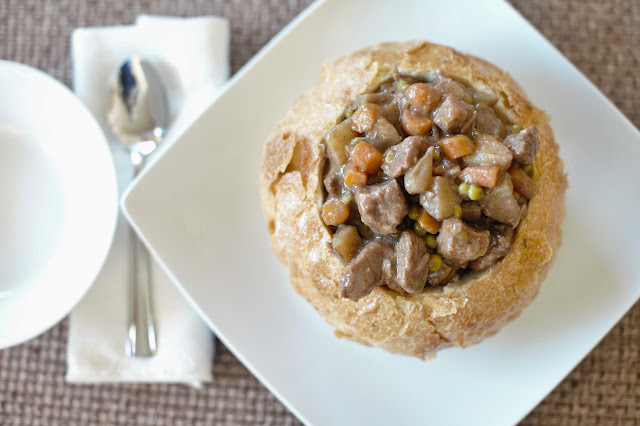 I enjoy soups and stews with bread...heck, how about a bread bowl?